This package provides a WSGI middleware component which aggregates profiling data across all requests to the WSGI application. It provides a web GUI for viewing profiling data. rationale is that there are a bunch of lazy / "first time"
__del__). If it's false, profiling data will not be deleted. which returns a lot of data. It defaults to false. As you exercise your application, the profiler collects statistics about the functions or methods which are called, including timings. 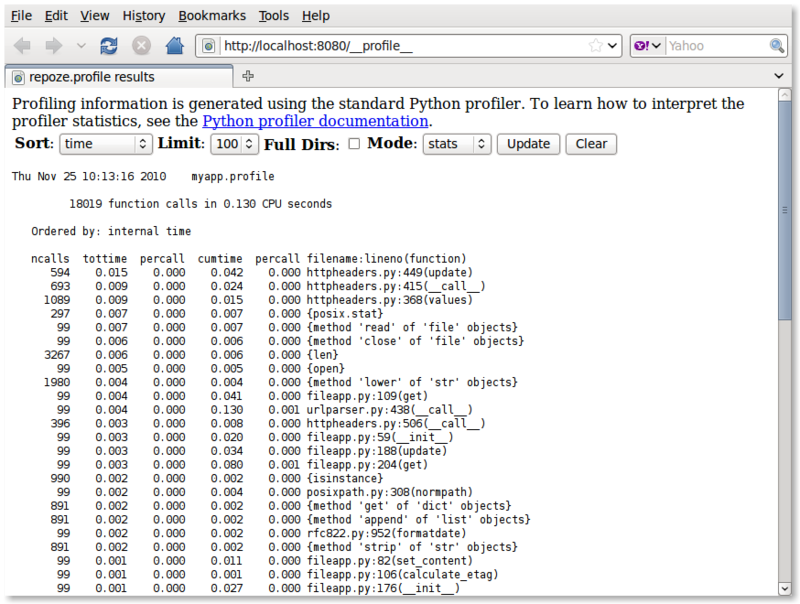 Please see the Python profilers documentation for an explanation of the data which the profiler gathers. Once you have some profiling data, you can visit the configured path in your browser to see a user interface displaying profiling statistics (e.g. http://localhost:8080/__profile__). The results of the profiling will be sent to standard out. The title will appear at the top of the results, for guidance. All other arguments are optional. sort_columns allows specifying the columns to sort the timing results. See the Python profilers documentation for available options. lines is the number of lines of results to print. Default is 20. Zero means no limit. Visit https://github.com/repoze/repoze.profile/ to report bugs. Fork the repository to submit patches as pull requests. © Copyright 2010, Agendaless Consulting, Inc. Revision a7a246c2.